In many ways, this photographic debate is very much like the Mac Vs. PC debate. In many ways, it’s not. The debate has always been fuelled by passionate fans of each camear system, with each group saying that their system is the best, or ‘better’ as the case may be. Each group points out minor flaws in the other’s camera system, with very few people looking at the bigger picture. My father has always been fascinated by old cameras and has quite a collection of beautiful cameras from many different companies. So I’ve grown up with quite a few different cameras in my hands. My Nikon F3, with a Hasselblad and Zeiss Ikon Contaflex in the Background. 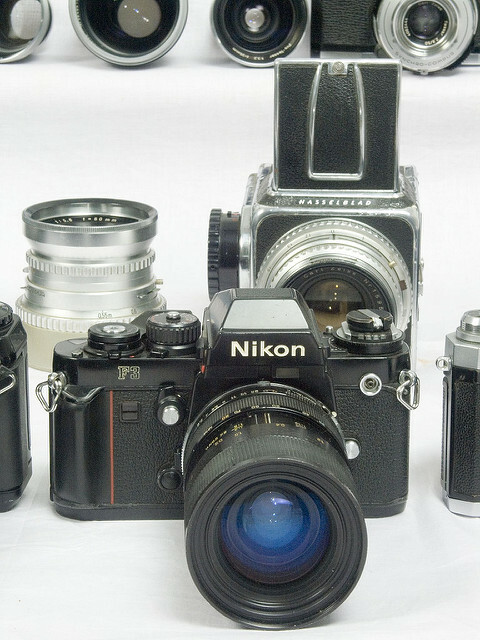 Nikons have always been a fascinating breed, especially the F series, and I’ve used quite a few of these cameras. Canon too have had some revolutionary cameras and revolutionary technologies, but here is not the place to point them out. I’ve used many Canon and Nikon cameras, both digital and film, and I’ve had the opportunity to analyse their pros and cons dispassionately, because during all of this time I was using Minoltas or Minolta copies (all with film, mind you). We’ll only be looking at the good parts of these systems as the bad ones have been discussed to death and beyond. Even when I first started taking pictures with a digital camera, it was with a tiny 8 MPX Konica-Minolta A2. However, professional shoots required that I use a more ‘professional’ camera, for which I used to rent a Nikon D100. Later, when it came to the question of buying a Digital SLR, the question was more CCD Vs. CMOS than Nikon Vs. Canon. However, the question of brand was important too, because of the lenses. The choice that was made was for Canon, and for the 5D with two L series lenses. Since then, I still continue to use Nikon Digital cameras, and not at all infrequently, so let me tell you what I think of them. Nikon users have always boasted that their camera systems are more intuitive to use, that the metering is amazing, that the auto-focus is fast and accurate and that the camera bodies are rock solid. I agree on all of these points. Nikon cameras have also had great autofocus and metering mechanism which professional photojournalists will swear by. They also have the marvellously customisable “Creative Lighting System” which gives you much more creative flexibility than the Canon equivalent will allow you to wrestle from it. Ask David Hobby, he swears by it (well almost, I haven’t quite heard him do so). I personally think that the Nikon bodies have a much more intuitive positioning of buttons. Making it really easy to concentrate on what the subject is doing. One camera really stands out in this regard, the Nikon D200. The Nikon D200 has many, functions on call with just the press of one of the many buttons and selector switches on the body. Canon users will have to dig deep in a menu system to find many of these same options. I love Nikon for this. Nikon have a very vast range of lenses, and almost all of these are interchangeable with even the newest of camera bodies. Many Nikon lenses are exceptional, with magnificent contrast and resolution. I do find their terminology rather un-necessarily excessive and confusing in comparison with the Canon system. DX, VR, D, G, ED, IF, et cetera, et cetera, et cetera…So Nikon finally do have a full framed sensor with their new D3 which finally does 12MPx like the 2 year old Canon 5D but stays at nearly half of Canon’s leap ahead (21.1 MPx with the 1Ds Mk III). Canon users have had the benefit of many new technologies such as the eye-enabled auto focus in the EOS-3, and Digital camera users have CMOS technology that apparently surpasses the quality of imaging that CCD sensors could offer. 35mm Canon cameras wind the film onto the take up spool when the cassette is first inserted into the back of the camera and then rewound into the cassette as photographs are taken, making sure that your pictures are safe if camera back was accidentally opened and film exposed to light. Neat, eh? Canon’s full-frame sensors, and cinematic style full-frame video capabilities were a real game-changer in the digital photography world, and photographers who were just buying digital kit all went ahead and switched to Canon at the time. For many, the full-frame aspect of the sensor sealed the deal. And their magnificent L series lenses, gave them less to worry about. A winning combination for many photographers. However, Canon does lack the intuitive menu system of the Nikons. In fact, the menu of my 5D distinctly reminds me of the Konica Minolta A2. Digging around in it feels like hunting for an Easter egg. However, they now have a competitor for the title of ‘worst arranged camera menu’, and that is Sony. For many years, it was an either-or situation for those who wanted to play in the digital 35mm / SLR game. Of course, Hasselblad, Phase One, Mamiya, Leaf, and others had better attributes in medium-format or large format cameras, but those aren’t really practical solutions for most people. The introduction of Micro 4/3 cameras have sparked a revolution in photography that I didn’t think would happen. Manufacturers like Sony, Panasonic and Fuji have emerged as leaders in these formats while Nikon and Canon have continued to try and compartmentalise their strongholds. They segment their consumers, and try to hold back features. They want you to buy a SLR camera for just photography, and buy their (much) more expensive, C series cameras for serious video work. However, consumers have moved past that phase, and Canon were the people who moved them past that stage. Consumers no longer one device for each type of work. We want one device that can do it all well, and Canon were the ones who introduced us to that possibility. Sony, Panasonic, Fuji and others have pushed the capabilities of these tiny Micro 4/3 cameras and mirrorless camears, pushing image sensor technology to levels that Nikon and Canon are struggling to catch up with. These two brands have lost many loyal photographers as a result. Having the power to choose makes all the difference. So what is the real benchmark? How much noise you have or don’t have? Is your camera easier to use? According to me, those questions do matter, but not all that much! Does having a Canon rather than or a Nikon (or vice versa) make you a better photographer? I don’t think so… There are many great photographers out there who don’t use either… but that does not make them less, or more, as photographers. I think that it is important to choose a system that you think you’ll be satisfied with. If you’re buying into a system or thinking of changing your camera system, I’d say that the best system for you is the one that you think will best suit your need, and your budget. As for me, I’d be happy with either, but considering my propensity to shoot in low light with high ISO ratings, I think I’d prefer a Sony. Well, I can’t decide. What do you think? PS: if you think that this article sounds a little dated, you’re right. It was written more than a few years ago, before micro 4/3 and mirrorless cameras from Sony, Panasonic, and Fuji emerged as such a force in the photography community.